Any of you all have an F contra you'd be willing to part with for a reasonable price? Someone advertised a Chinese one with the valves converted to C/Db (my preference) for $1200 a while ago but they never responded to my messages. Also interested in any reasonably-priced all-purpose tubas for this bass trombonist to double on. Eb preferred, or if there's such a thing as an F that can hold its weight in large ensembles and recording I could be interested in that too. Of course, I'll entertain BBbs and CCs as well, but they'd have to be on the smaller side. Jonathan (Wessex) - pretty soon (if not already) - should be offering a contrabass like that (at least, according to updates). Were I you, I would just bide my time and wait for him to bring it to market. These (again, according to posts) are supposed to feature (more desirable, imo) regular rotors, rather than those (as previously seen from various sellers) wretched copies-of-whatever valves. Being in Bloomington, you aren't as far away as are some from Jonathan's warehouse. 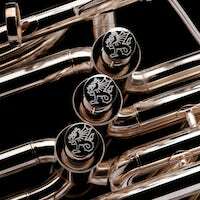 As to Eb tubas, Jonathan also offers a compensating Eb made by Jinbao, as does - I believe - Dillon Music. Those actually play pretty darn good. I've picked up used/underpriced Jinbao comp Eb tubas and resold them for market value once or twice myself. me...?? I'm a John Packer (aka "JP") dealer. They offer two grades of compensating Eb tubas: a student grade and a professional grade. The professional grade JP comp. Eb is competitively-priced (new, with case and shipping) a bit lower than the typical "used English-or-German-made Besson" price, and (in my honest judgement) every bit as good as the best Besson/B&H Eb comp. tubas. Further, the included hard case is absolutely crackerjack. There's also a "student-grade" JP comp. Eb, which is priced considerably lower. I also judge it to be also be better than some of the other China comp. Eb tubas, but (well...) not as sublime as the model described in the previous paragraph. You should read the two paragraphs above about "stuff that I sell" just as much as advertising as informational, and should base your opinions on your own experiences and judgement. Others, surely, will tell you about what they are offering. It's a huge improvement over the old one, and offers the tuning you desire. The new Wessex coming out looks great, I've been following the updates on the prototype. I've played a few Wessex instruments and some of them blew me away, so I know they can be great. My only reservation about this particular one is that a couple professional players I know tried the prototype at NAMM and said that it was pretty terrible. Wonder if that's just an issue with the prototype. Finetales wrote: Thanks guys for your replies. Neither Wessex, or the prototype contrabass trombone was at NAMM - so they were obviously talking about something completely different? I'm very excited about this new trombone. Jonathan, will it have both sets of tuning options, or just the prototype set up C/Db? The trombone should be supplied with both sets of slides. I can only say for certain if in the box when they arrive in the warehouse and I can check. Thanks for getting back to me guys. Sorry for the mix up, I had a feeling I got the conference wrong. I meant TMEA, not NAMM. The bass trombonist of the Houston Grand Opera was there and one of the people I know that tried it. I'm still very interested in the new contra, as it does look like a huge step up from Thein clones (which is saying something, as some of them play really well). It will be hard not to pick one up immediately. I've played contras in both tunings, and I just can't get comfortable with F/D/Bb. I need the valves to be in the same proportions as a bass trombone, as I really think in F when I play it rather than "this is like playing my bass with the first valve down" as I play bass sackbut as well. Finetales wrote: Thanks for getting back to me guys. Sorry for the mix up, I had a feeling I got the conference wrong. I meant TMEA, not NAMM. The bass trombonist of the Houston Grand Opera was there and one of the people I know that tried it. I'm still very interested in the new contra, as it does look like a huge step up from Thein clones (which is saying something, as some of them play really well). It will be hard not to pick one up immediately. I've played the Rath, Thein (not the one that Jin Bao copies, but a newer model with screw bell that's achingly gorgeous), Laetzsch, and Jurgen Voigt. But I've never owned any of them so I think I would do just fine with something affordable on a mortal's budget.